On this sunny autumnal Sunday I attended one of the few club digs I have been able to make it to this year, what with commuting between Poland and the UK and an unreliable Rover 25 (since sold for scrap). 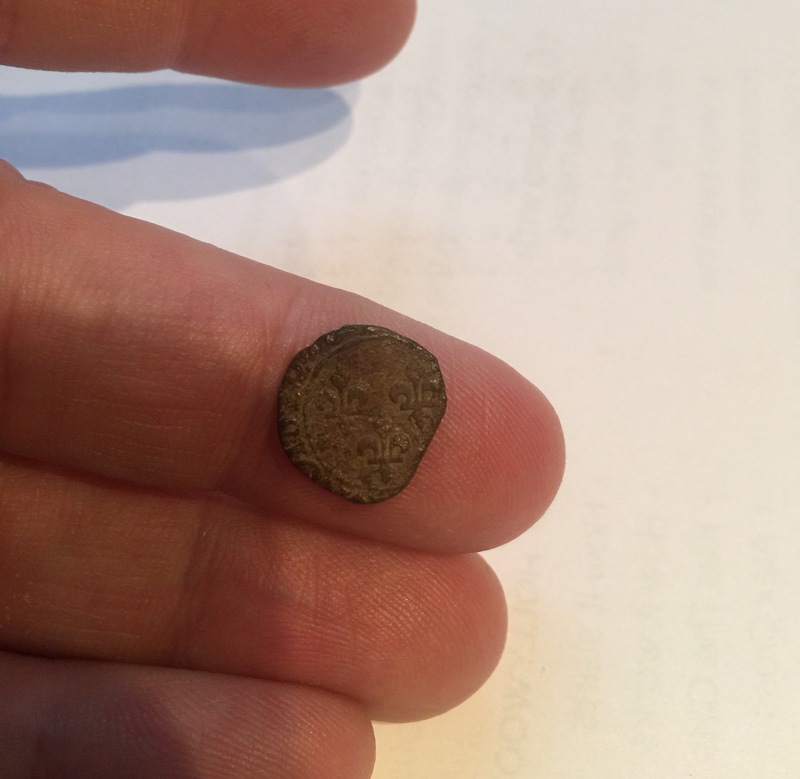 The dig was near Brookhampton in Oxfordshire, and even with my truncated Deus lite (no remote and only the 9″ coil) I managed to turn up a lace chape, a Roman fragment, and a hammy with its image worn smooth. I also turned up what might me an ancient fastener or toggle, though I lack the skill to date such things. 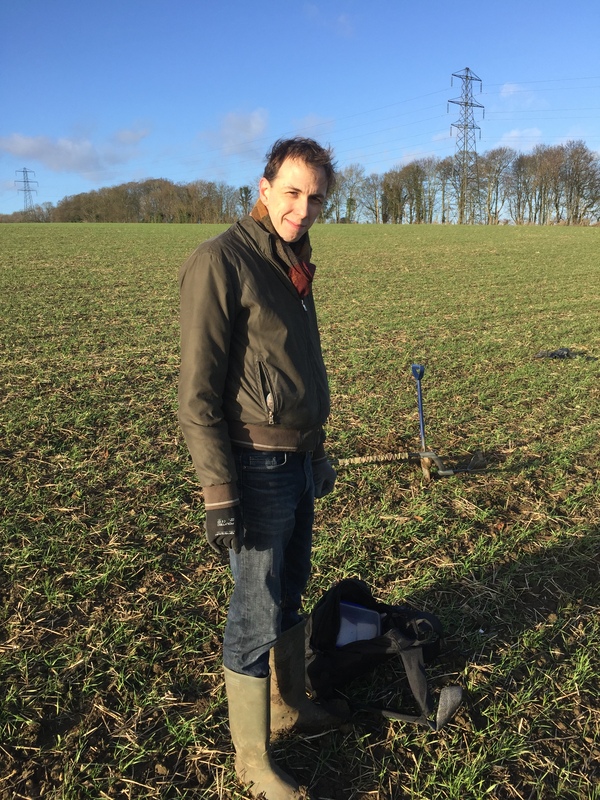 I spent a warm English country Christmas with my dear friend Gabriel and his family. I could not have been more warmly hosted or better fed. 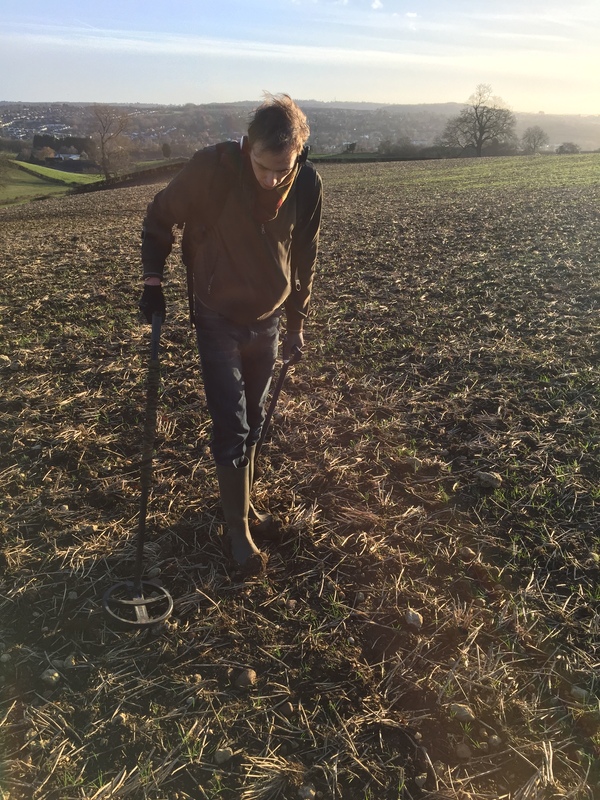 On Boxing Day, Gabriel and I went for a walk and a brief detecting session along the Roman Alley uplands of my permission. 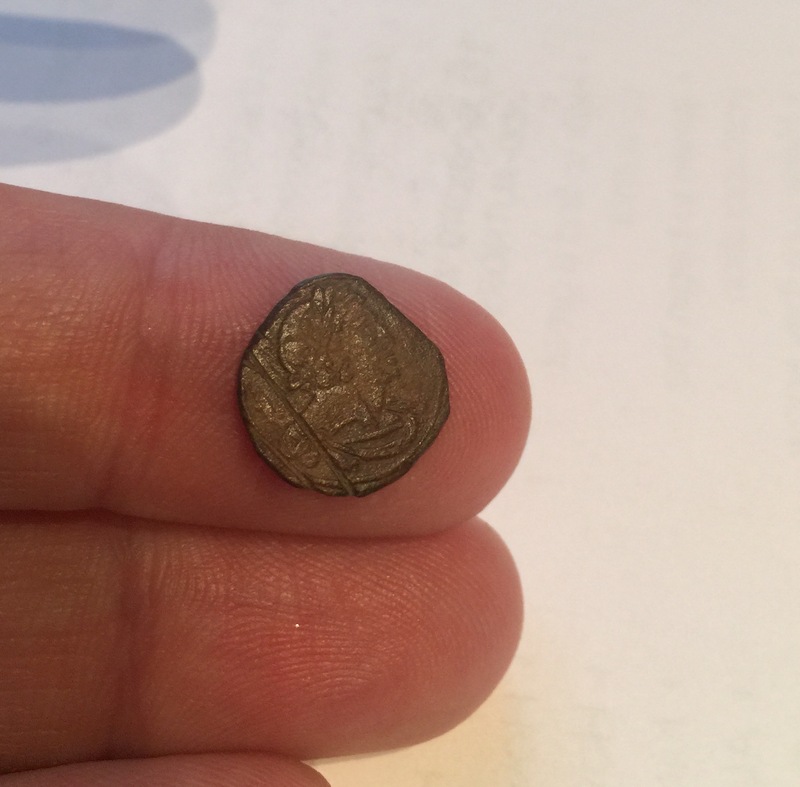 Gabriel has been detecting with me a number of times, as faithful readers (you nonexistent folks) will know, but we had yet to find a properly ancient coin. Our luck changed on the Boxing Day ramble. 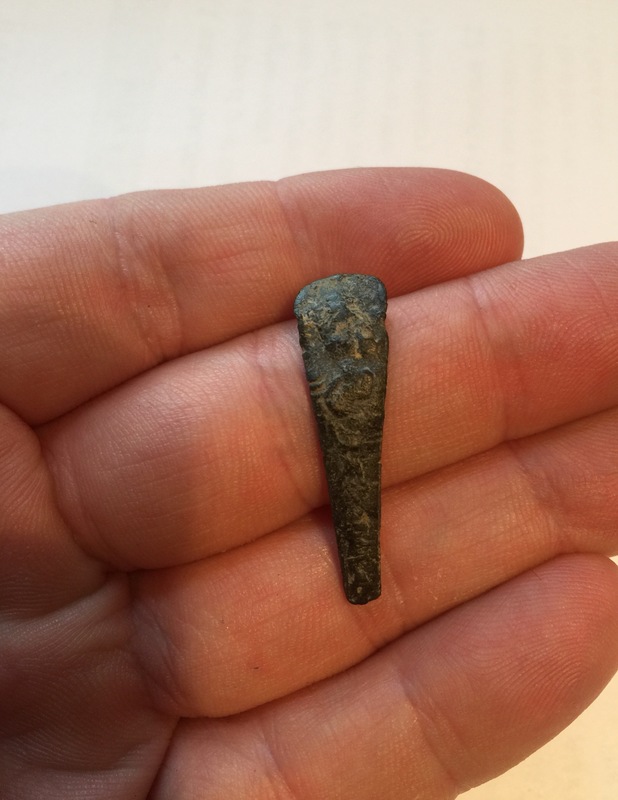 We found a decorated bit of what might be bronze or copper alloy, which looked for all the world like part of a torc. 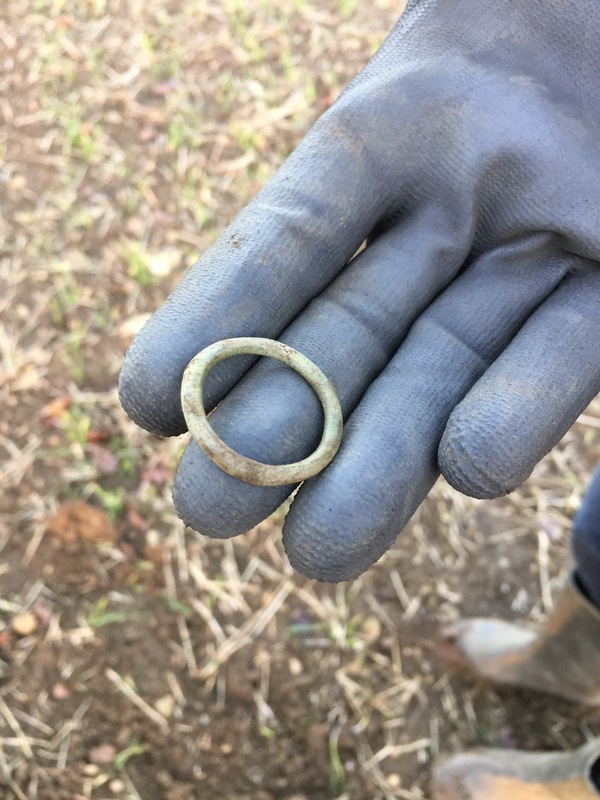 It has yet to be identified, but there is also a chance that it is a bit of farm detritus from sometime in the last two millennia. 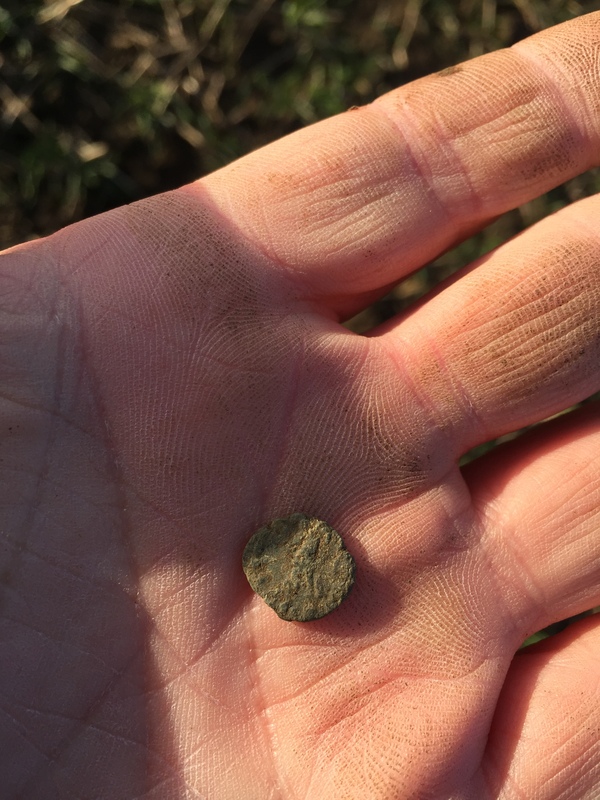 I found a stolid lead weight, and then we got another solid signal, digging together and using the pinpointer to reveal Gabriel’s first Roman, a grotty nummus. He took it home and submerged it in olive oil to see about removing some of the accretion. I met Ian S____, the Chairman of the Society of Thames Mudlarks, digging his usual great holes near Queenshithe. He and his mate had had a nice Krauwinkel jetton, coming out of the mud looking like burnished gold — nothing else that they would admit to. I showed him the grotty Roman nummus that I had just beyond Millennium Bridge, eyes-only on the north side, and he seemed sceptical. ‘We haven’t had much Roman around here’, he said, and I remembered when I’d been with Steve Brooker and a young mudlark had shown us a rose farthing that he’d professed to have found that day — Steve admired it, but once we’d moved on, he told me that he was sure the guy had kept it in his wallet to show off and not found it that day at all. I got the same sense of scepticism from Ian, and when I enquired again about the Society, he told me the rolls were full and mentioned that the most recently elected member had made a famous find of gun carriages buried in the river mud, as if to emphasise the grandiosity requisite for election by comparison with my own modest discovery. As the tide flowed and rose, I crossed the river to search beneath the Globe, as the Southwark side is here the last obscured by water. 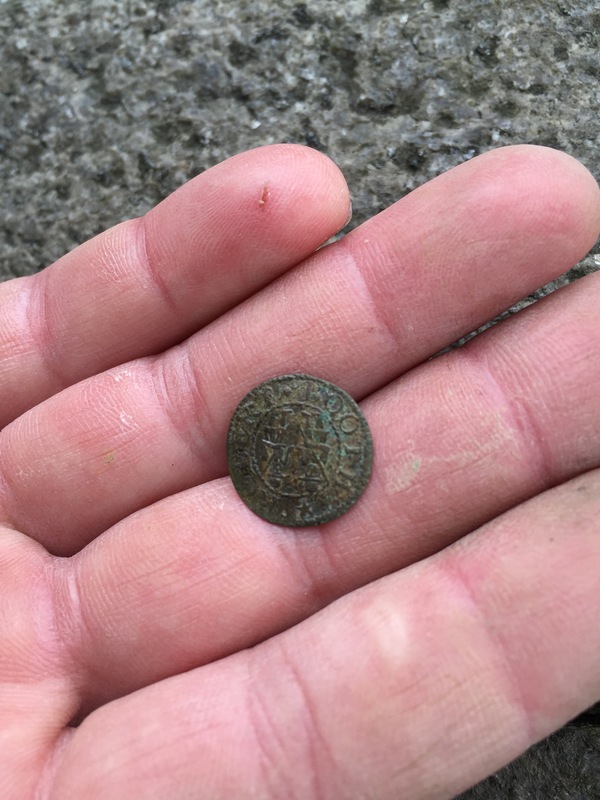 Scraping up near the retaining wall, I found a hammered bronze coin with three fleur-de-lis on the reverse and a laureled head on the front. It seemed early modern, but I thought perhaps Napoleonic, given the bust. 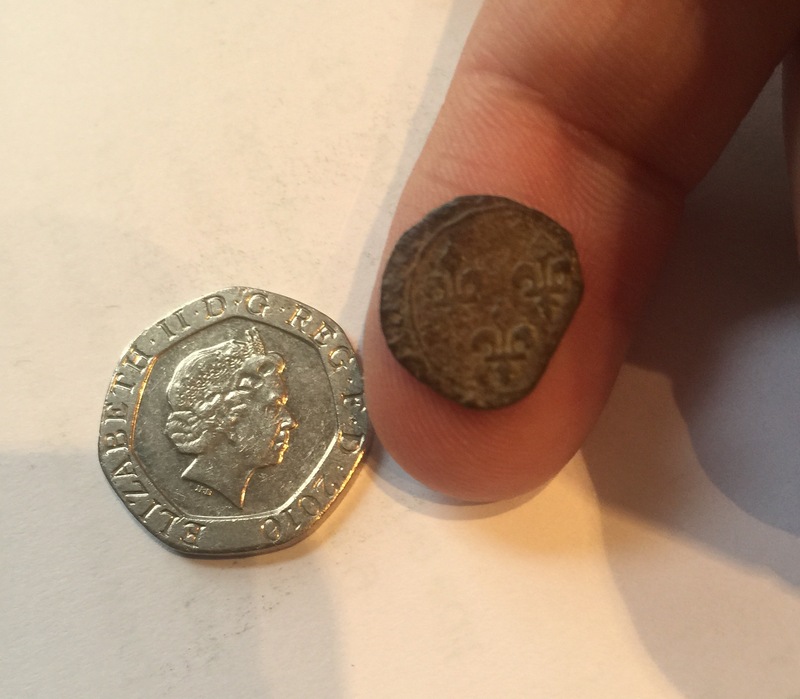 An amateur numismatist in my Twitter feed later ID’ed it as a double tournois of Louis XIII, so early 17th century. The other finds of the day included some modern clad and the decorated handle of a pewter spoon, also found on the north bank. This morning I met my friends Ed Adkins and Sam Wills at the Tate end of Millennium Bridge for a bit of mudlarking. The weather mainly cooperated and the company was excellent; it was fun to sift the history of the city while performing a Brexit post-mortem with an economist and a historian — like discussing causes of death with our hands in the cadaver. We scraped on the south side of the river for awhile but nothing of note turned up. When we crossed the Thames we had more luck. 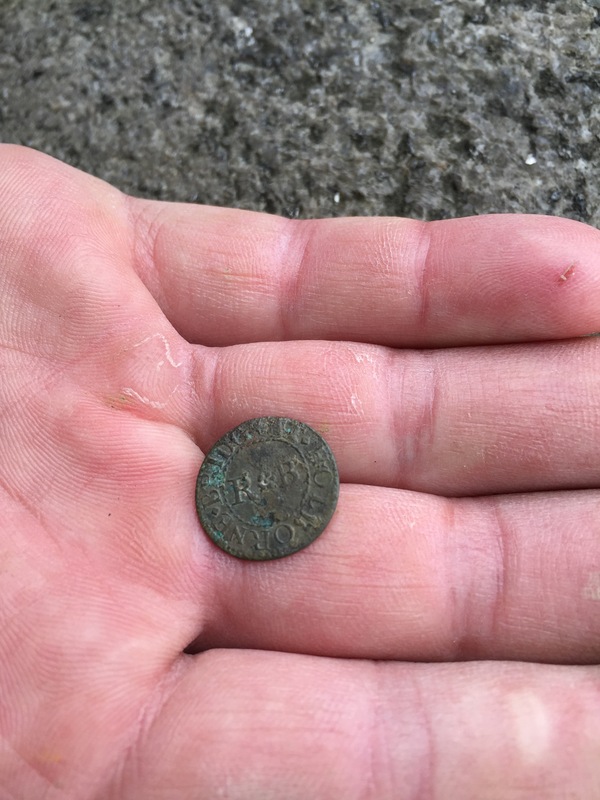 Sam found a 17th c. trader’s token of Robert Booth, Holborn Bridge. 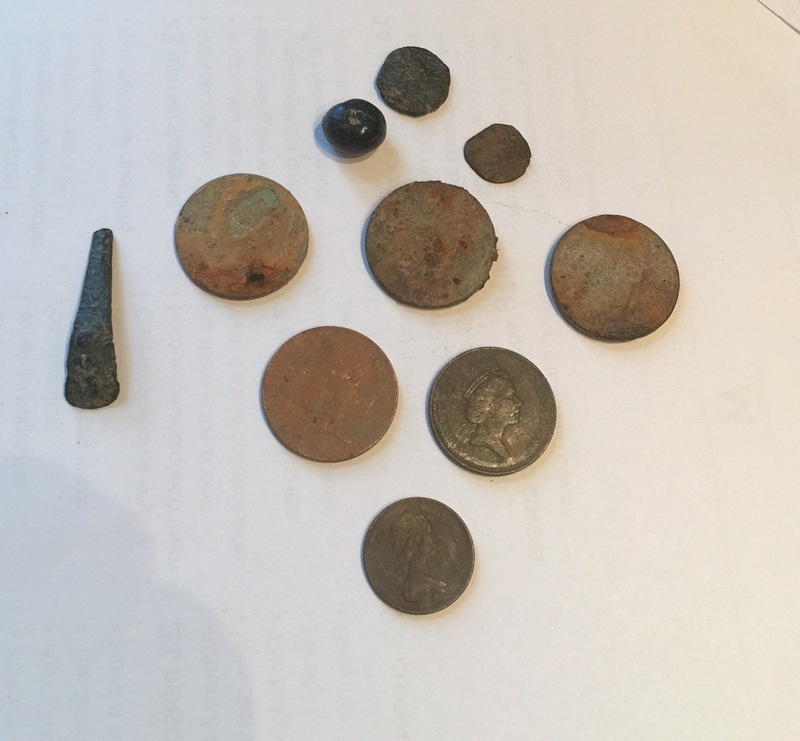 I had a couple of buttons and modern clad, and Ed collected a handful of pipestems and fragmentary bowls. 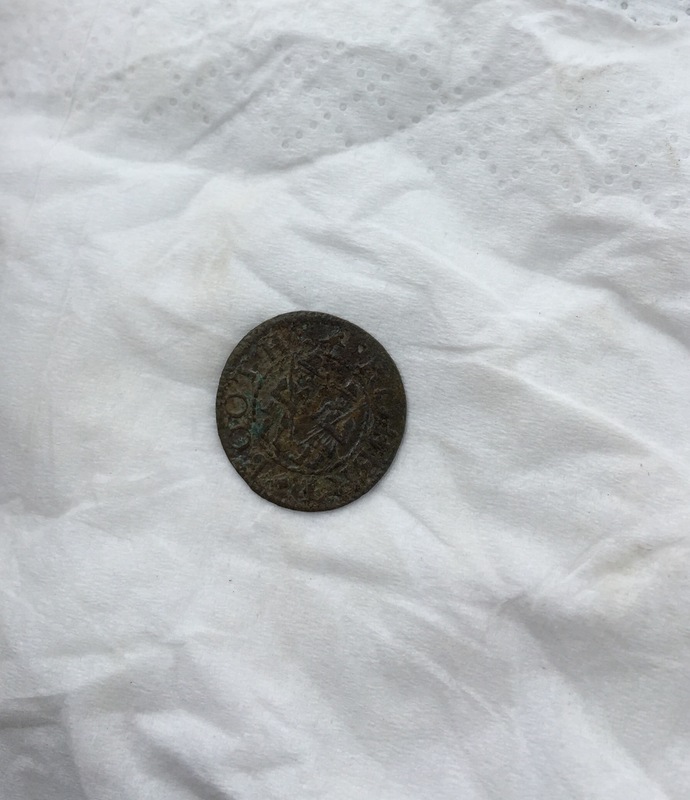 Sam’s find was definitely the class of the day, not only in our little group; it attracted the envious attention of others on the foreshore, who asked repeatedly to have it out for a look. Definitely one to record with the PAS. After our lark we had lunch at a pub overlooking the river, and then coffee on the sixth floor of the Tate Modern. We watched the river rise to cover the foreshore where we’d searched, and we looked out over the city, trying to descry the future in the lineaments of its grey stones and steel.